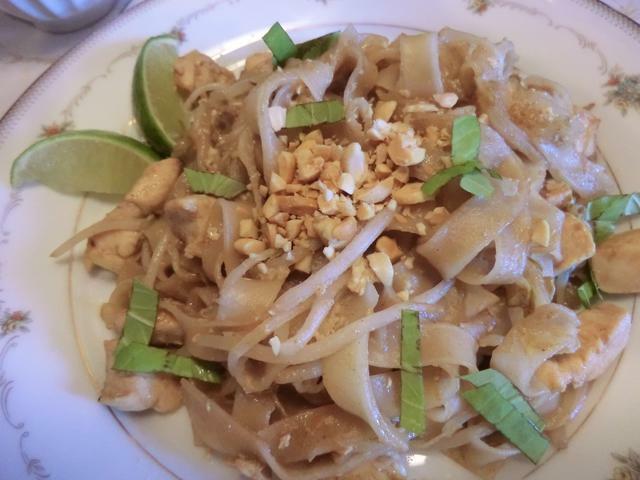 rice noodles | Cooking is Fun … Really!! 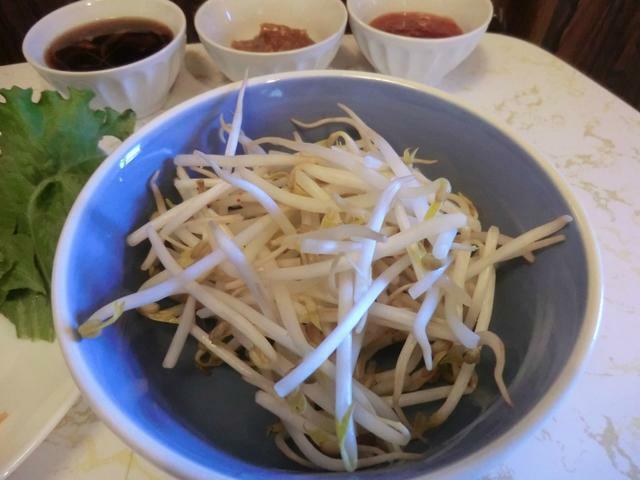 Bean Sprouts … what to do with them? 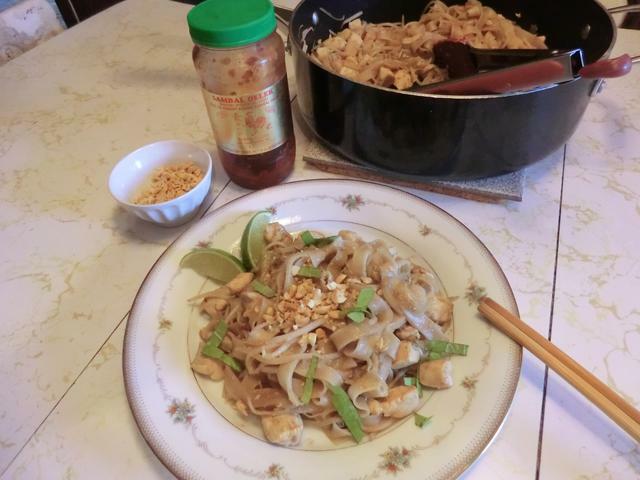 Whenever I make Pad Thai, I always have about a pound of bean sprouts to use up in a couple of days, before they go bad. 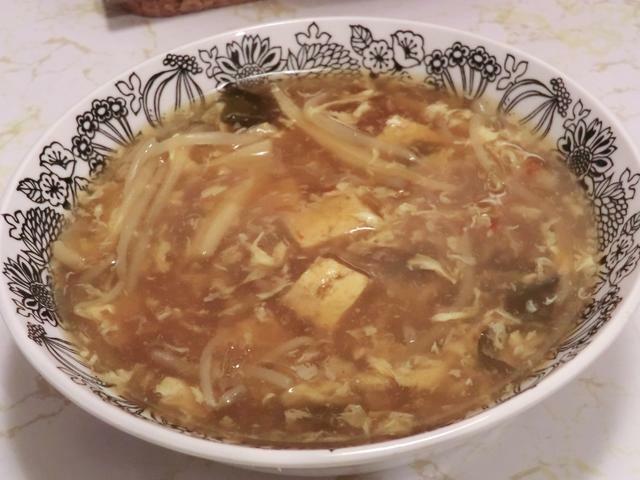 Usually, I make hot and sour soup, because I have things in the pantry to make it with. Like a can of bamboo shoots. Dried seaweed I can rehydrate in five to ten minutes. And diced tofu in the freezer, where I keep it for a quick pot of miso soup. I THOUGHT about making chop suey but, I didn’t have any protein thawed and limited time available, about half an hour. 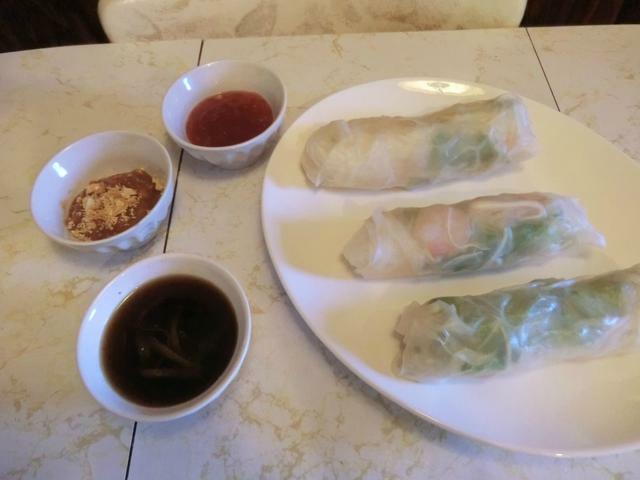 Of course, summer rolls (the ones with the rice paper you have to soak) or egg rolls are a possibility too, but you have to plan ahead for them. And then there’s the frying with the latter. 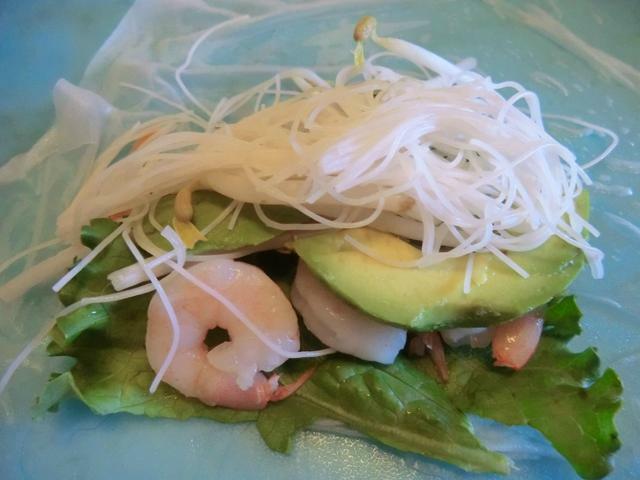 What do YOU do with your bean sprouts if you buy them? 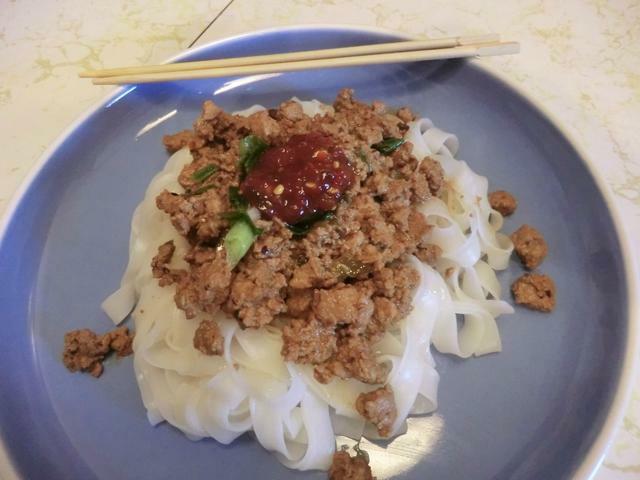 I’ve never had this Szechuan-inspired noodle dish but while surfing the net for something new and inspired to do with a pound of lean ground pork, I ran across this recipe. And it sounded delicious. Best of all, I had all the ingredients or, at least, close substitutions. So, I cobbled together this recipe using common elements from 3 that I found. 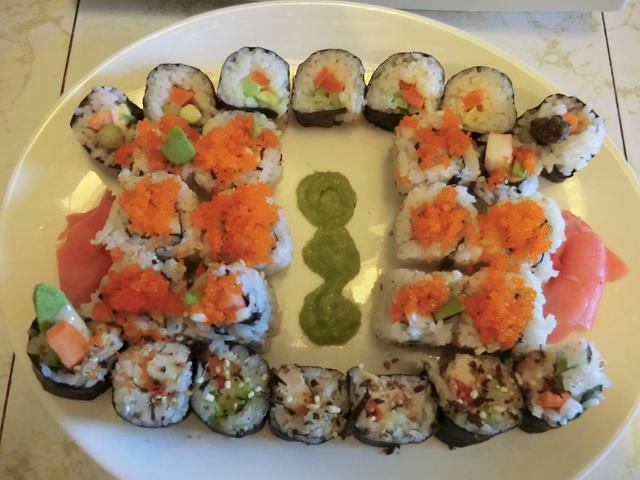 The result was well worth the time researching and making the dish. My tummy is full and I’m a happy camper. Even better, the meat sauce is a great make ahead so I only have to cook the noodles and pour the thawed topping over it. A few garnishes and you’re all set. 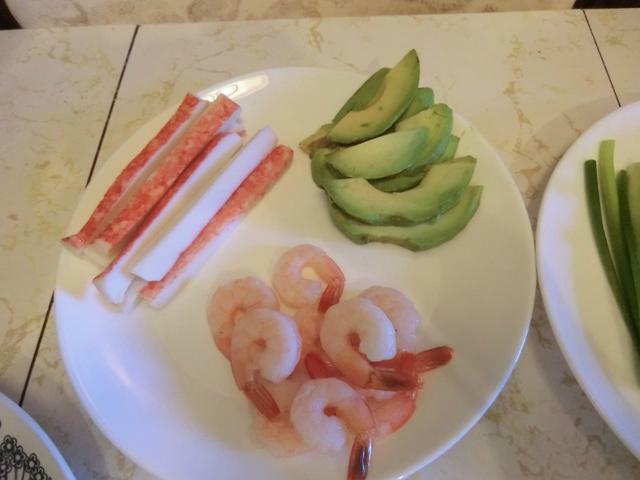 You may prefer to mix half of your toppings with the noodles and sesame oil in a large bowl and then top with the rest of the meat and garnishes. 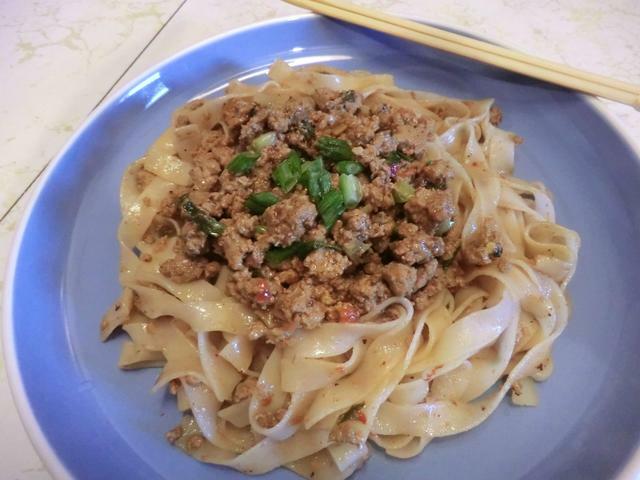 I’ve served the meat over fettuccine noodles and the rice noodles above. They were both great. Cook 4 servings of noodles … rice (4 oz/113 gm per person), whole wheat ie spaghetti or fettuccine (85-100 gm per person), udon etc. Drain, rinse in cold water, drain well again. Drizzle a teaspoon or two of toasted sesame oil over the noodles to prevent sticking and for flavour, toss lightly to coat and divide among 4 bowls. NOTE: You may want to wilt some fresh spinach in a saute pot as well and add it to the noodles for a healthier dish. I don’t have fresh green onions, only frozen in the freezer so I sprinkled several tbsp into the meat and mixed the onions through until they were thawed. Other optional garnishes include pickled mustard greens, roughly chopped cilantro and chopped dry roasted peanuts. In a large saute pan, over medium-high heat, add the oil. When hot add the ground pork and brown for several minutes, breaking up the pork as much as possible. Add the grated ginger and cook for another few minutes until the pork is lightly browned. Add garlic bean paste, ground Szechuan peppercorns, both kinds of soy sauce, rice wine and black vinegar, sugar and red pepper flakes. Stir through and cook for several minutes. Add the tahini paste and chicken stock and simmer for 5-7 minutes until the ‘sauce’ is as thick as desired. Taste and add a pinch more sugar if too hot. Spoon the meat topping over the 4 bowls of noodles and sprinkle green onions on top. This post is a clearance of some rolls I threw together in June but didn’t feel like blogging about. 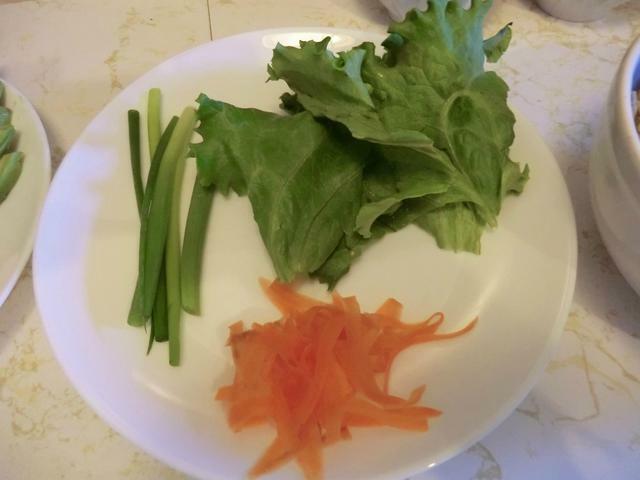 It’s been ages since I made summer rolls, let alone posted my efforts. My nephew and I always order them when we go out for Thai food. 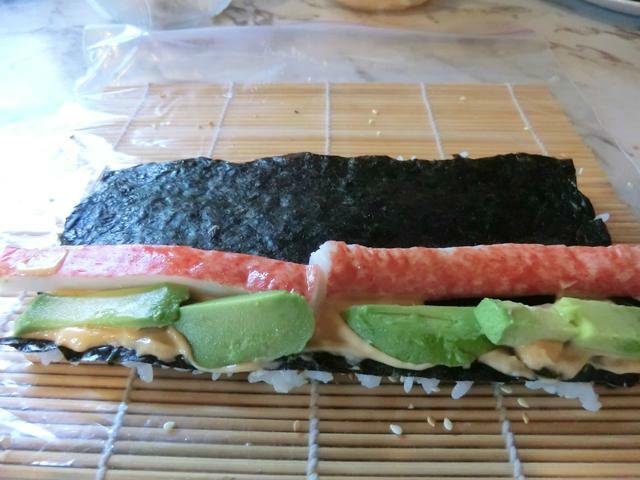 This summer, he’s not coming home to visit so I’m going to make them for myself and enjoy them while remembering. 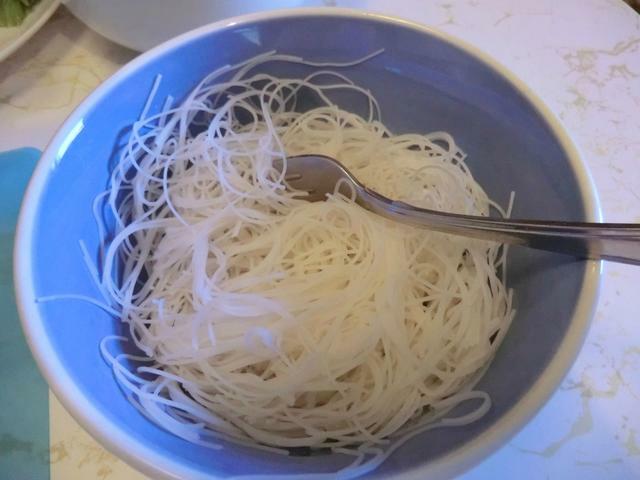 This version has the more traditional ingredients of rice vermicelli/noodles and bean sprouts but no fresh herbs. If you can get your hands on fresh mint and Thai basil, use them. You’ll enjoy the taste. 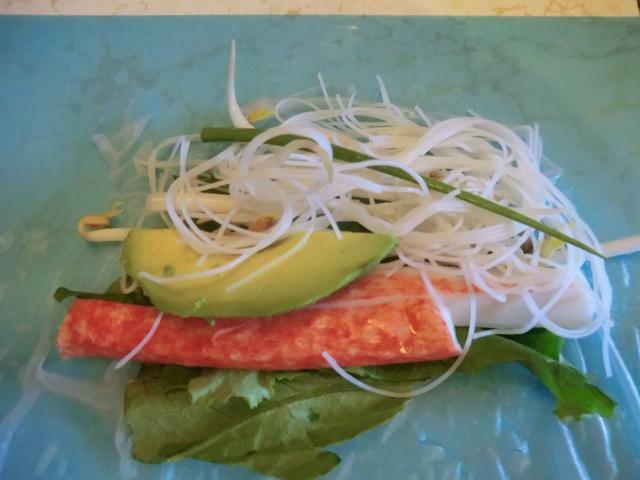 I made 8 rolls, half filled with fake crab and half with cooked and thawed shrimp. 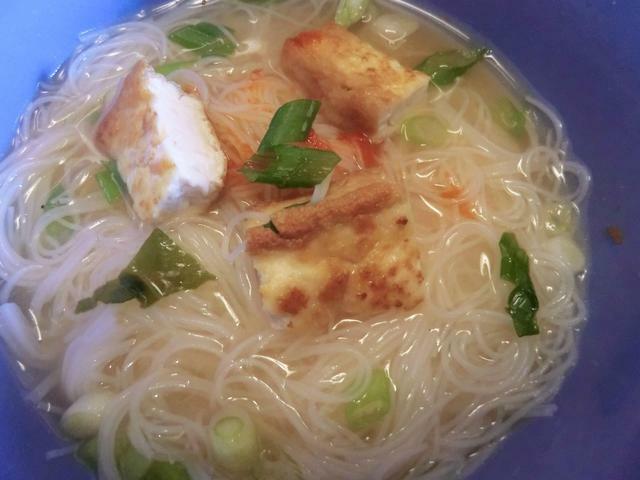 I had leftover rice vermicelli which ended up in the miso soup that you’ve seen. Dips: Sweet and sour sauce, sweet chili sauce, plum sauce or your favourite Vietnamese dipping sauce. I’ve posted a peanut dipping sauce in an earlier post but I find it too heavy to go with these delicately flavoured rolls so the dipping sauce is still my favourite. 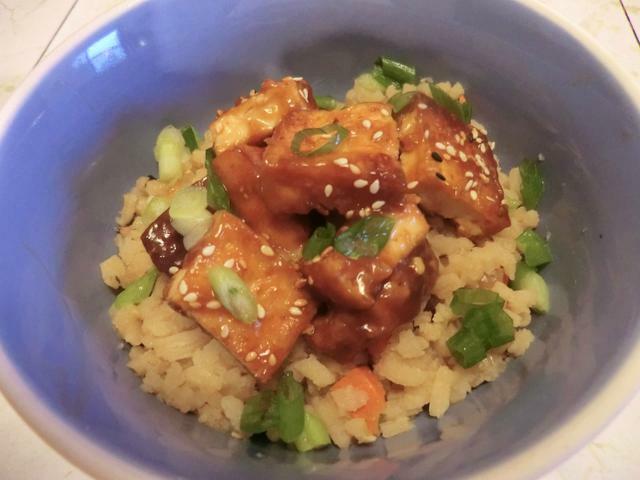 I’m a proud carnivore but every once in a while I bring home a tub of tofu and make something relatively ‘healthy’ with it. 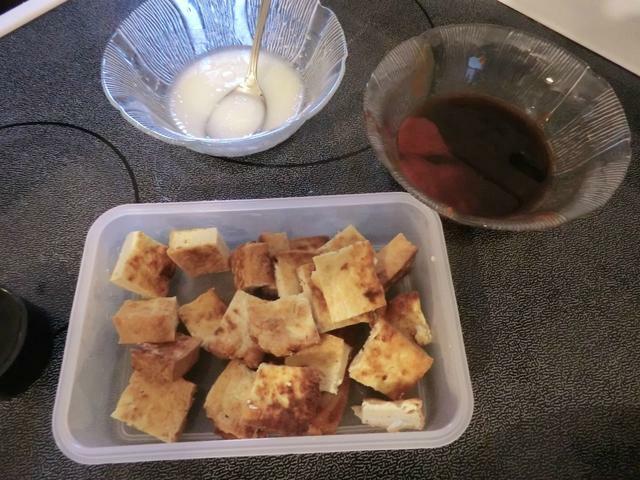 To date, “Mapo Tofu” is my favourite way of eating this soy product, though cubes of tofu added to miso or hot and sour soup are tasty as well. 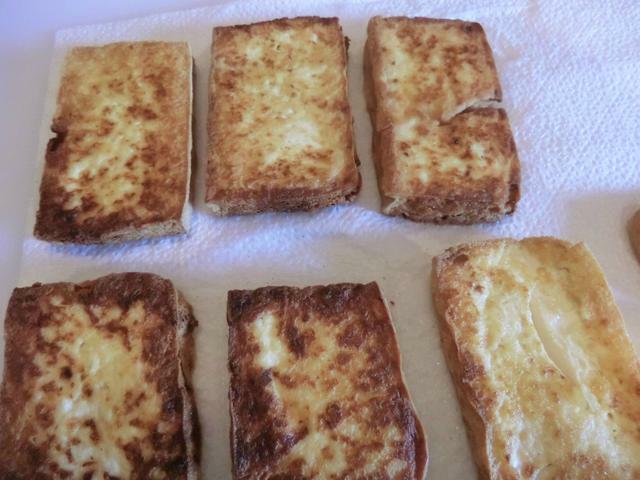 NOTE: Baking is a healthier option in making this dish, than the one I chose, which was to shallow fry the sliced tofu planks in 1/2 inch of oil until browned on both sides, and then draining the fried tofu on paper towels. I’m including the healthier baking version of this recipe below. 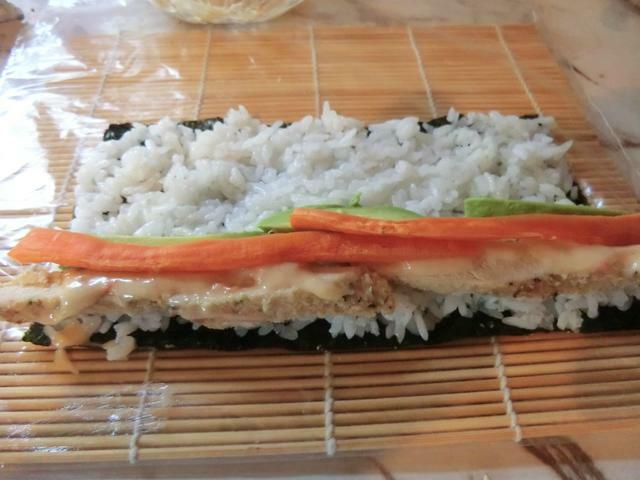 Drain the tofu and cut into 3/4 inch thick slices. 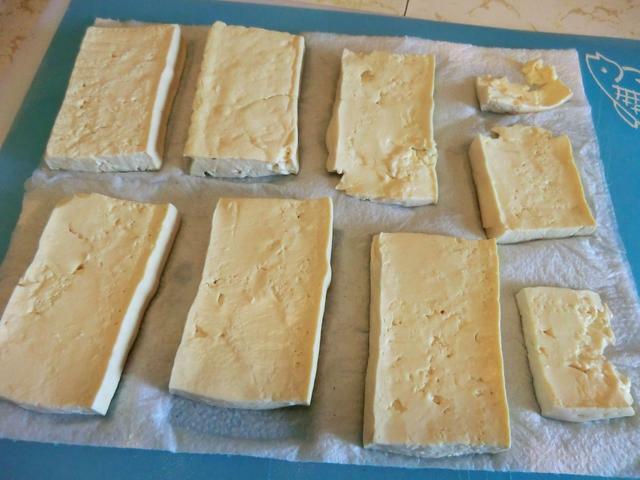 Lay the slices of tofu in a glass baking dish and pour the boiling salted water over the tofu. Let the tofu soak for 15 minutes. Drain, lay tofu on several sheets of paper towelling and cover with several more. Press gently to dry tofu as much as possible. Grease a cookie sheet with 1 tsp of your oil. Arrange the tofu pieces on the cookie sheet and place in the oven for 15 minutes. 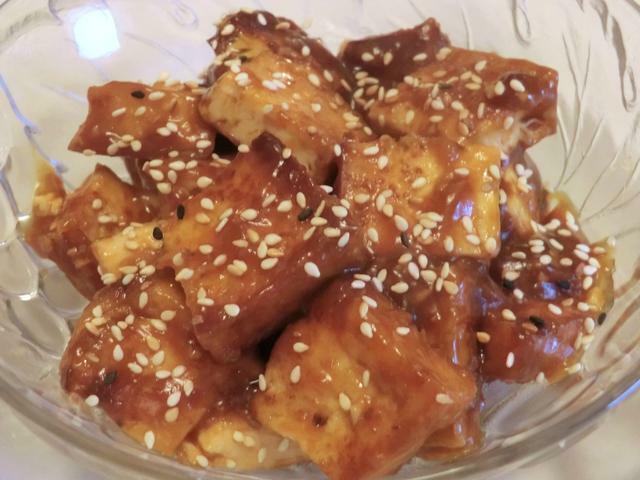 While the tofu is cooking, combine brown sugar, hoisin sauce, sriracha, soy sauce and rice vinegar in one small bowl. In another small bowl, combine the cornstarch and water. Mince or grate ginger and garlic and set aside. When tofu has cooked for 15 minutes, flip the tofu and return to the oven for another 15 minutes. Meanwhile, warm 1 tsp of oil in a non-stick saucepan over medium heat. When the oil is warm, add ginger and garlic to the pan and cook for a minute or so. If the ginger and garlic sticks to the bottom of the pan, don’t be concerned. Add the 1/4 cup water and as the water simmers, use a spatula to release the ginger and garlic from the bottom of the pan. Keep scraping until all of the ginger and garlic comes off of the bottom of the pan. Add the brown sugar, hoisin sauce, sriracha, soy sauce and rice vinegar mixture. Bring to a simmer, then turn down to low until tofu is ready. Once the tofu is ready, add the corn starch mixture to the sauce and increase the heat to medium. Stir constantly until the sauce thickens and darkens. Toss the tofu in the sauce to coat and serve over rice. 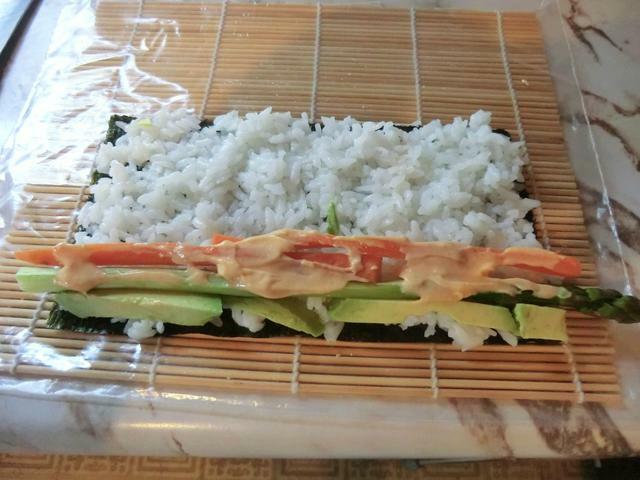 Garnish with toasted sesame seeds and/or sliced green onion.